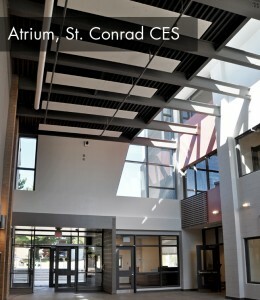 Designing Schools for the ‘Whole Child’ : The Atrium is Where the Heart is | Snyder | transformative design. controlled outcome. The Oxford Dictionary defines the atrium as an “open-roofed entrance hall or central court in an ancient Roman house”. In the case of school design, it often serves as a connection point for functional learning spaces or corridors. But more than this, it’s a place where students can connect, learn from differences, and build relationships. 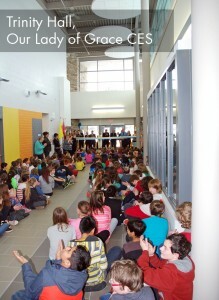 The atrium is the heart of the school. Much like David Thornburg’s “watering hole” and “campfire”, the atrium is a place where students learn through interaction and storytelling. It’s the epicenter of active social learning which is especially important in the digital age. Moreover, it provides a vital student forum. A real sense of belonging and ownership makes learning personal. One meaningful memory or learning experience can mean the difference in a student’s success. When learning spaces help spark a love of learning, then we know we have done our job. Dramatic sight-lines engage staff and students.